With five distinct amp “characters” to choose from, support for acoustic-electric guitars, and access to a wide range of customizable effects, the BOSS Katana 100/212 combo amplifier represents a new generation of flexible amplifiers for practice and performance. A set of familiar controls allow for fast tone shaping, and you can use the BOSS Tone Studio editor software to further customize your amp settings and effects. The Katana 100/212 is also equipped with a tilt-back stand so you can hear the amp better, and an adjustable Power Control that allows you to achieve cranked-amp tone at lower volume levels. For a does it all amplifier for electric and acoustic-electric guitar, you definitely need to check out the BOSS Katana 100/212 combo amp. 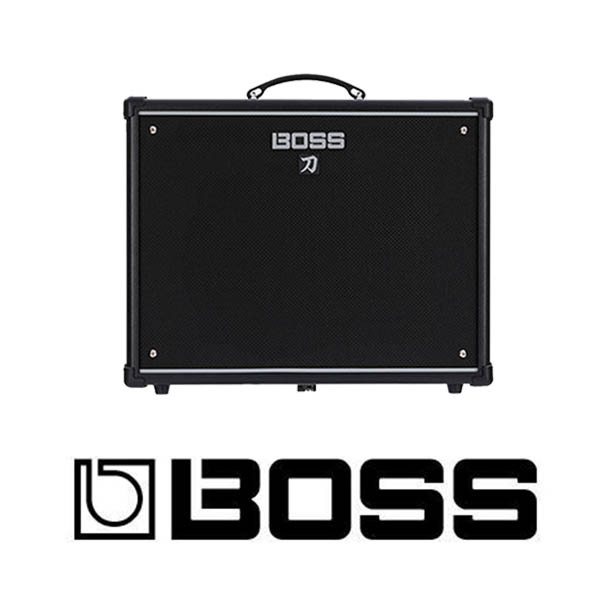 The BOSS Katana 100/212 combo packs five distinct amp voicings. Clean, Crunch and Lead cover the range from chiming clean tones and gritty rhythm tones to solo-worthy high-gain leads. As an added bonus, the Brown setting is derived from the BOSS Waza amplifier – think iconic ’80s metal. And finally, the Acoustic mode allows you to plug-in your acoustic-electric guitar too. No matter what style of music you play, or even what kind of guitar you play, there’s a world of tone to explore in the BOSS Katana 100/212 combo amp.